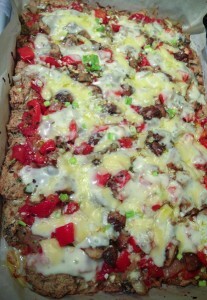 Comments Off on Wheat Free Pizza! 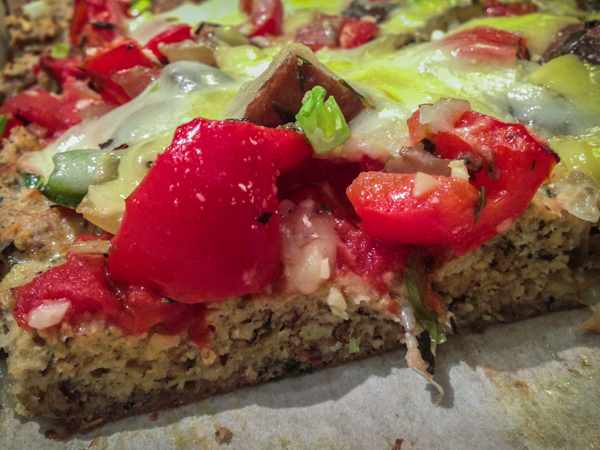 Have you been looking for a satisfying pizza that isn’t based on a poofy wheat crust? Here’s your answer, and it’s delicious. It’s based on the recipe for Basic Focaccia Flatbread from The Wheat Belly 30-minute (or less!) Cookbook by William Davis. I absolutely LOVE this cookbook. The recipes are fast, well tested (no fail!! ), low glycemic, low carb, and DELICIOUS. Bake in the 375 degree oven for 15 minutes or until it is lightly browned, and looks a little crispy on the edges. 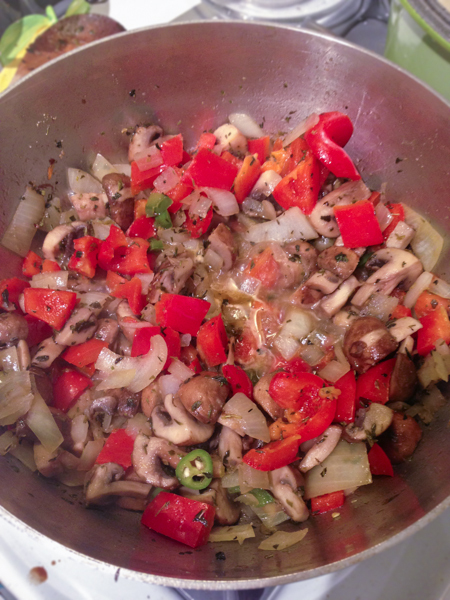 While the focaccia is baking, mix your chopped veggies that will be your topping, and sautee on your stovetop in 1/4 cup Extra Virgin Olive Oil. I used all three cheeses and garlic, it’s a delicious combination. Drizzle liberally all over the top of your veggie covered focaccia with Extra Virgin Olive Oil. Place it back in the oven for 15-20 minutes, or until the cheese has melted a bit. Take out of the oven and slice using a pizza cutter. *It’s easier to slice when everything is still warm. 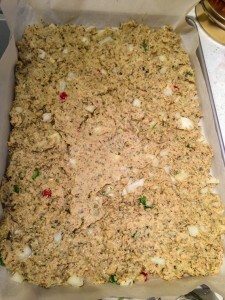 Notes: I have tried this recipe without the onions in the focaccia crust, it is not as moist. I prefer it with the onions, it is much more savory and delicious. I also tried it without the Pomi (I forgot to grab one at the store!) I used sundried tomatoes instead. If you use these, make sure to soak them in boiling water for 20 minutes, or they will be leathery. I still prefer my original recipe using Pomi, over the sundries tomatoes. Finally, to warm a slice or two up, place in your oven at 350 degrees, no need two warm up the oven. Heat for 20-45 minutes, your preference. It’s delicious.